We are very proud to have recently been awarded ISO 9001 certification, an internationally recognised standard that ensures our widespread services meet the needs of our clients through an effective quality management system. This means a great deal to us and the way we conduct business, having gained the ISO:9001 (2008) certificate in 2012. Our decision to work towards ISO 9001 accreditation demonstrates our commitment to providing a high-quality and consistent service to our clients and our ongoing investment in technology, development and processes and procedures. 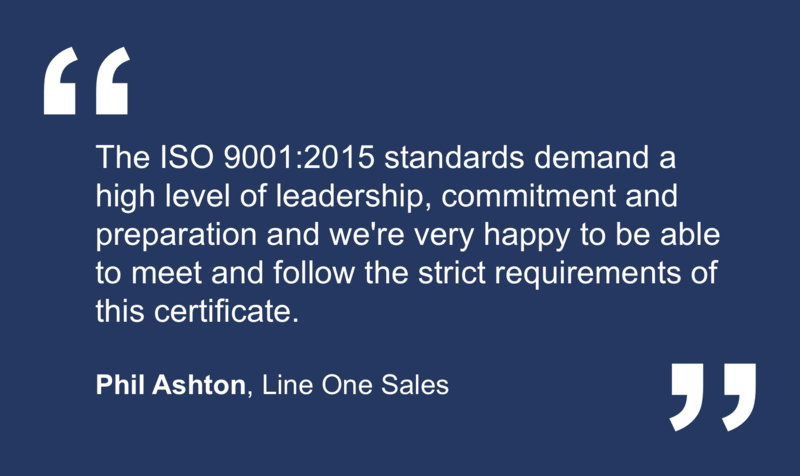 To become ISO 9001 compliant, Line One Sales underwent an extensive evaluation process that included quality management, system development, a management system documentation review, pre-audit, initial assessment, and clearance of non-conformances, all of which work to identify corrective actions that eliminate non-conformance to the quality management standard. Phil Ashton, one of our founding Directors, was delighted to be presented with the certificate, and commented “The ISO 9001:2015 standards demand a high level of leadership, commitment and preparation and we’re very happy to be able to meet and follow the strict requirements of this certificate”. Line One Sales’ clear business direction and “belief in integrity, customer service and core values aligns perfectly with the care, dedication and partnership model we hold dearly with all of our clients”. This successful ISO 9001 certification is testament to the positive engagement of our employees at all levels, and demonstrates a clear desire to embrace the standard as a fundamental element of its growth and customer focus strategies.